I heart wool. I love everything about it, down to the sheepy, lanolin smell of raw fleece. Occasionally I cheat and work with some other animal fibers. But very rarely, do I work with a plant fiber. But when I came across Jones & Vandermeer's Moo Cotton, I was intrigued. It is worsted weight and is 80% cotton and 20% milk protein fiber. Upon first touch, it feels like suede. It is by far the most interesting cotton blend I've come across. Personally, I find mercerized cotton too slick and shiny. Other cottons just feel dry. Maybe it's the milk protein that gives this yarn its unique feel. And after doing a little research on milk protein fibers, I found that it's naturally anti-bacterial, absorbs moisture and today it is considered environmentally friendly to produce. Sounds good to me! The Heathered Grey color of the Moo Cotton immediately reminded me of my first Eternity Scarf sample knit in Rowan Lima. In an experiment to test Moo Cotton's stitch definition, I knit one up. Well, I'm pretty sure it passed my test. 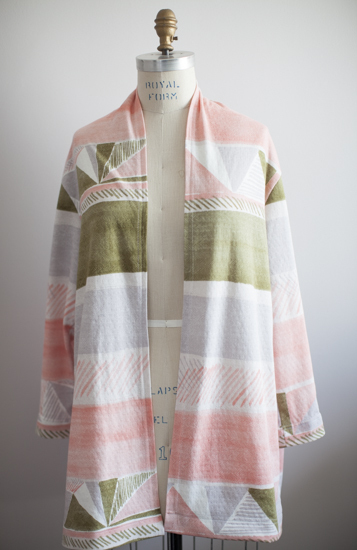 It's so incredibly soft and drapey without compromising any of that stitch definition. And, these pictures were taken AFTER I threw it into the washing machine and dryer. Now that, I can't do with my precious wool, can I? I've edited the pattern a teensy bit so it only takes one ball of Moo Cotton, and will have the printed copy at GAUGE + TENSION exclusively. Of course, you can always buy the PDF version of the pattern on Ravelry here. I simply left out a few rows of the stockinette and a repeat of the horizontal cartridge rib. Stop by GAUGE + TENSION this Fall if you'd like to feel this yarn for yourself. It's really special, and perfect for those with a wool sensitivity, get too hot wearing animal fibers or for babies and kids. Hansencrafts miniSpinner - Maple wood with Woolee Winder. In addition to what comes with spinner, Hansencrafts threw in a little BFL from Abstract Fiber, and a beautiful Orifice Threader! What a treat! I had initially debated about which wood to get - there is quite an extensive selection - but I decided to go with the economical maple wood. It also happens to be the wood that fits in with my decor. It's really beautiful. Aside from its obvious qualities, I just love the scotch tension knob. My ladybug wheel's scotch tension is a little wonky. It works just fine, but it doesn't feel very finished. And to change bobbins couldn't be easier with this metal clip. Press it down and the side of the spinner falls flat. Voila. It's perfectly thought out, and such good quality. Everything feels sturdy. Best of all, it can sit right on my desk! Just shove that keyboard aside - who needs that anyway?! When scouting out pop-up locations, I was lucky enough to have run into two renters at the location we decided on. Both renters were so helpful, kind, enthusiastic and encouraging about the space and our idea. Shop Reverie was the first tenant I popped in on. Such cute clothes, super fun and young. Oranbeg Press was the second and their creative display and evocative artwork and literature was really something else. 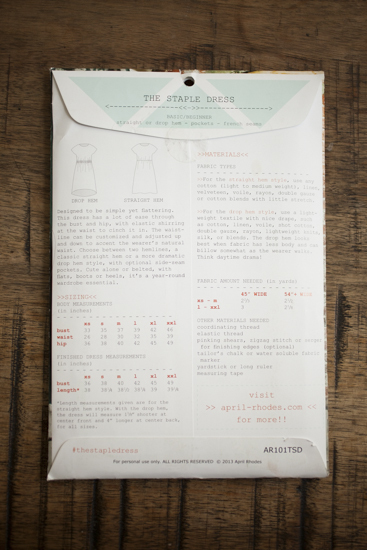 Jones & Vandermeer presents: The Staple Dress by April Rhodes sewn in Cloud 9's Palos Verdes / La Venta cotton voile. Emily, of J&V, and I started chit-chatting about my fabric conundrum after I posted about my black scrubs and my Easy Tee which I love, but is simply not flattering. I had this conversation with a number of friends who sew, and I think I'm left even more confused now than before. I simply have to keep experimenting between fabric, fiber and silhouettes. In her ever supportive and optimistic way, Emily decided she needed to help me on this voyage and when I proposed trying the voile with the Staple Dress she generously offered to sponsor this experiment and had me pick out which print from Cloud 9's Palos Verdes line I wanted to use. While they're all beautiful, I went with the La Venta print. We also decided that the voile was way too thin to be worn alone with any decorum. So I'll be lining it with some plain voile from the same collection. I've never lined anything before, so this'll be... interesting. But I figured this has got to be one of the easiest silhouettes to start with. It's basically a long tube with some shaping and openings for arms and neck. Technical drawing on back of envelope shows the two variations. I've also never worked with voile before, so I was curious. I did a little reading online and this is what I've come up with. Voile and Lawn are very similar in that they are both semi-sheer, evenly woven and are generally made of cotton, linen, silk or wool. Lawn fabric is made from threads that have been combed first to make it super smooth and silky in feel. (Immediately I thought, "Oh, it's like a worsted-spun yarn!") They're both very crisp, and I don't know if that's a characteristic of the weave, or if it's a treatment applied to the fabric once it's woven. Because of voile's delicate nature compared to something like quilter's cotton, I found some advice on what needle and thread to use. A cotton machine embroidery thread was suggested, so I bought some Mettler 60 wt. cotton embroidery thread from Rose Rushbrooke. And I made sure I had some 70/10 machine needles. While I was prewashing the fabric, I decided to get started on the muslin. After trying it on, I found it a bit snug in the armhole, and that I'd rather the top of the sleeve a little longer. (I am not a fan of my upperarms.) So I extended the shoulder line, and brought down the armhole and reconnected those new points. Larger armhole by lowering the opening point. As a knitter, I'm so used to the front and back armholes being the same, I forgot that these pieces would be different. Anyway, I repeated the process of what I did on the front to the back instead of simply copying the front line onto the back piece. When I grabbed the fabric out of the dryer I made note that it did shrink a bit. But there was no color bleed at all. And, the crispy stiffness was gone. The voile was much softer than I originally thought. A nice surprise. I used my new pattern pieces to cut into the voile, and used tailor's tacks to mark. 1) In addition to cutting out the fashion fabric, I cut out the front and back pieces in the lining material. 2) Sewed shoulder seams for dress, and then for lining, separately. I think I should have done sewn them together, but it turned out fine. 3) Sewed together at neckline, right sides facing. Then, understitched lining to the seam allowance. 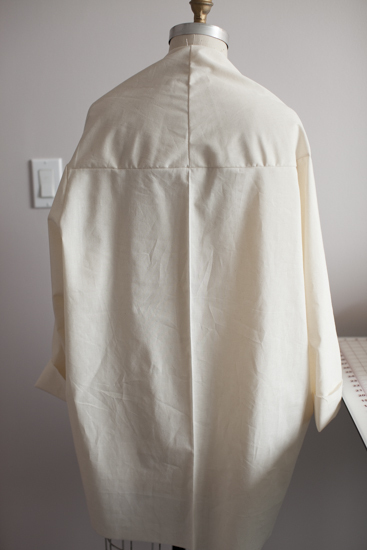 4) Using the burrito method (starts on Step 5), sewed the lining to the fashion fabric at armholes one at a time. This burrito method is brilliant, and much like the "Yoke Trick" that Pam Howard uses in her Tailored Shirt class. Understitched the lining to the seam allowances for each armhole. Got a little fussy getting under there, but worked out fine because the armholes are large enough. If I had followed all of Blithe's instructions I would have sewn the shoulder seams together. Oh well, next time. 5) With the lining and the dress laid out separately (not tucked into one another), I sewed up the entire side seam from the bottom of the dress up to the bottom of the armhole, and then onto the lining fabric and down to the lining's hem. Per the pattern instructions, I stopped for the pockets on both the dress and the lining. 6) Sewed up the pockets per the pattern instructions, and sewed down the seam allowance around the pocket opening of the lining as a sort of finish and slipped the pockets through the lining's holes. 7) Finish off the lining hem shorter than dress, then hand stitched dress hem to lining. I love hand stitching, especially for hems. They're the part of the garment that needs to have the most fluidity whether it's the bottom of a dress or trousers. Whenever I use a machine to tack down the hem it always looks so stiff and seems to not hang naturally. That, however, could be my machine sewing skills or lack thereof. 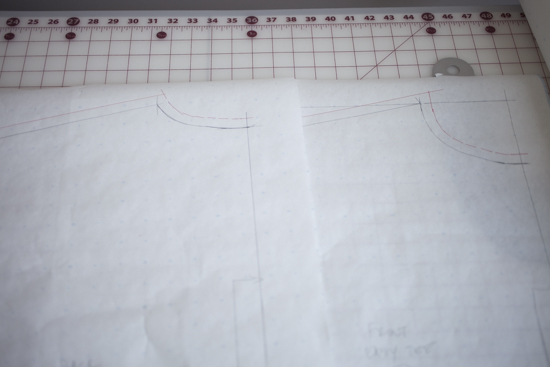 8) Shirred at each side through dress and lining for waist shaping. So here is my dilemma. I'm not sure I like the shirring. I don't know if more shirring would help. Single line of shirring on either side at the waist. I could shirr all the way around, or just the back with a few more rows. I didn't originally want to shirr all the way around because I don't like the potbelly-paunch you get below it. I already have a stupendous potbelly so I don't need help exaggerating it. A friend has convinced me that an elastic may be a softer way to add some waist shaping. So I may try that. I may add a casing to the inside of the lining and slip in a 1"-1.5" thick elastic in there and see what happens. But it may need something. I don't wear belts, so I don't think that's a solution for me. I'd love to hear your input on the shirring. You guys a big fan of it? Will keep you posted on what transpires! I have become slightly obsessed with other's stories. I love hearing about their backgrounds, their successes and failures, and the other lives lived before reaching their current place in history. When I sat down about a year and a half ago and wrote about my transition from Corporate America to working for myself, I wrote a bit about my background and all the little things I had done and big people I had met along the way that formed my decision and what I decided I wanted to do to make a living. I became curious and wanted to know about everyone's backgrounds at that point. What had brought all of us here to where we stand today? Of course, I know my friends pretty well and as interesting as all their lives are, I already knew their story. So I started reading biographies - Alexander Hamilton, George Washington, Abraham Lincoln, if you count "Abraham Lincoln: Vampire Hunter". (I do believe this is the true account of what really happened. The movie was horrible though. Don't watch that.) I am still fascinated by our forefathers, but I wanted something closer to home. A few months ago Nancy Zieman came out with her autobiography cheekily titled "Seams Unlikely". I thought to myself, "What's so unlikely?" She seemed like a nice lady who liked to sew and turned it into a business. So, I was intrigued by this unlikeliness and downloaded her book to determine for myself whether or not her life was unlikely. It is indeed unlikely. I don't want to spoil it for you, but her story is inspiring and humbling, like many success stories out there. Not only was she able to make a living from sewing, her craft, but she thrived and built a business so big she pretty much single-handedly supported a town with it. She is a true icon and even though I can watch most of her TV episodes online, I still set my DVR to record them. I like having her in my living room guiding me through the steps of my sewing. So when a friend invited me along to hear Heather Ross read from her new book "How To Catch A Frog", I tagged along in hopes of grabbing some more insight into someone else's story. You can probably guess at Heather's background by looking at her illustrations and her simple, flowy style of drawing and painting. But, I had no idea how it was merely the tip of the iceberg. What fascinates me more is how different her childhood was from mine. And while our style and craft are completely different, here we are in the same space. That's pretty awesome. I bought a copy of her book at the Powerhouse Arena in DUMBO/Brooklyn where her talk was held and it felt good to support a local bookstore and a fellow craftsperson. Heather had her friend Maggie preserve Meyer Lemons as a giveaway if you bought a copy of the book, and free charm packs for those in attendance. Not only was able to feed my curiosity into other's lives, but I got to feed my fabric hoard and my tummy. A very productive evening indeed! I haven't gotten a chance to read through Heather's essays, but it's already reminding me of Clara Parkes's "The Yarn Whisperer". So charming, and another wonderful insight into an incredible woman. If you haven't read it, it'll make your love of wool and Clara even more emphatic. As I started to clean up to prepare for the Breton Tee, I realized I had quite a bit of the Nani Iro fabric leftover. J&V was kind enough to have donated 5 yards for my Robe Cardigan. With just under a yard left (I had messed up those sleeves that ate up almost another yard), I tried to figure out what I could do with about 34". A cowl! How creative of me, huh? Huh? Um, not really. But it would be fast to whip up in this gorgeous fabric. And I'll have a coordinating piece for the cardigan! Um, not really. I would never wear those all together and look like Crazy Nani Iro Fangirl... even though I am. First, I laid out the fabric flat, and cut up exactly in the middle parallel to the selvedges. Then, I serged the short edges together, right sides together. Next, I folded the fabric in half lengthwise, right sides together. Lining up the just serged seam together, I serged the long edge together. The short seams "lined up", and the long seam horizontal. I pulled it inside out so the right side was out. If you just wanted a scarf, you could simply finish off the edges and be done. But since the length was a little short to be a scarf, I tried to figure out the best way to close it up. With the right side out, I folded the piece in half, lining up the long seam. This is hard to explain, but with the long seam lined up, the right sides are together, and you can slip the edge under the serger with the wrong sides facing out. It was almost like inserting a sleeve into am armhole. I serged around and stopped when I couldn't serge anymore, which was about 4" away from the start. Right side out, with right sides together - once you start serging together, the inside flips out. I flipped it around, and all that was left to do was slip stitch the opening closed. Voila! A knit cowl in about 15 minutes. Cowl doubled around for a shorter length. Crazy Nani Iro Fangirl. I've got my halloween costume all sorted out. Awesome. It's no secret how much I love knits. And to me, knits have meant hand knits for the past several years, not ready-made knit fabric yardage. When I got into sewing, I started quilting first. It seemed to be much easier than garment sewing. Straight lines, some ironing and the trickiest being the binding. (Of course, advanced quiltmaking techniques make my head hurt, but beginner quilts are fun and easy.) So when I started poking around the garment-sewing world, I started with wovens. I think that goes for pretty much everyone. I guess you could say that a straight-up woven cotton fabric behaves better than a knit. Knit fabric can shift a bit while cutting, especially if you don't have a large enough work area to lay the entire piece flat. And the inherit stretchiness made me assume that I would be warping and twisting it as I went. Seems like I'm not the only one warming up (a lot) to sewing with knits. Colette just came out with a Guide to Sewing Knits by Alyson Clair. Of course, I bought it right away. Although there are no patterns in there, it is exactly what it says: a guide. A very clear, concise and pretty guide. I absolutely love it. With my serger out, I'm feeling empowered to keep taking on more knits. My next project: The Weekender Breton T from Hot Patterns. When this pattern arrived, I was a little taken aback. The size of the pattern envelope is that of regular letter sized paper. And it was thick. 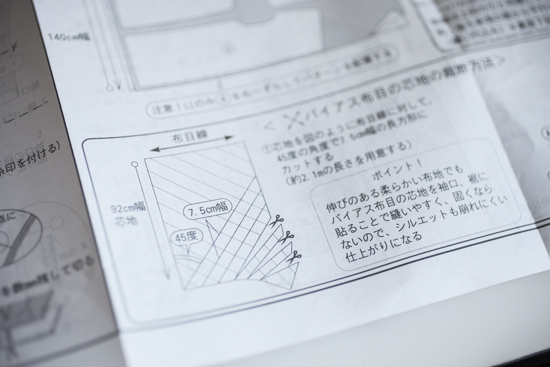 Once I took out its contents I realized why - they use regular weight paper for the pattern. YES!! At a price that's comparable if not a bit cheaper, it's a great deal. White on Navy, or Navy on White? This is an interlock knit which is a bit thicker than a jersey knit. It seems less summery, so maybe I'll make one for the Autumn. And for all you hand knitters out there - interested in crossing over and sewing with knits? It's a completely different experience, but one just as rewarding. One major benefit of sewing knits instead of knitting knits is fixing mistakes. While you can't always compare the two, because sometimes you can really screw up in sewing where there's no turning back, fixing a sewn mistake is usually much easier and faster. I happily whip out my seam ripper, while I usually have to take a deep moment when I realize I have to rip back half a day's work. Hoping I can squeeze this in before the end of National Serger Month. There is really no reason for the rush, except I like giving myself deadlines. Fingers crossed! Today I'll be covering the making of the The Robe Cardigan Muslin. I left off having cut out the pattern pieces of my traced pattern. With only 3 pieces, it was very fast and easy. First, what is a Muslin? Muslin is the term used for a kind of first draft mock-up of a garment. It's named after the undyed, less expensive cotton fabric, used for making the mock-up. Essentially, muslin can refer to either, and the mock-up can really be made out of anything you want. Swedish Tracing Paper is this amazing kind of paper sewers use to trace off a pattern and sew together for the mock-up. It's a little stiff, but it's even less expensive than muslin, and can give you a pretty good idea of your finished piece. It's a nice alternative. I buy muslin by the bolt at Joann Fabric & Craft Stores. They always have coupons or deals, and when I get a "40% off one item" coupon, they don't mean 1 yard. They mean 1 cut. So, I get the whole 25 yard bolt at 40% off, which ends up being around $45. It's a great deal. Please note: Usually, you would want to make a muslin in a similar fabric as your final garment. I should be using a knit fabric, one that imitates the Nani Iro Double Knit, but I don't have any on hand. Also, this particular project isn't form-fitting, so I'm not too worried. I just want to make sure everything fits aka it's big enough to get over my linebacker arms and shoulders. With the pattern pieces laying smoothly over the muslin, I strategically put down the weights so they won't be in my way while I'm cutting. With my rotary cutter, I carefully and slowly cut around the pattern. I find when I use pins and scissors, I end up shifting and warping the fabric. And when there's a nice long straight edge, I'll take out my rotary cutting ruler and use it as a guide. Because I'm a righty, when cutting around a convex curve, like a sleeve cap, I like to keep the pattern piece to the left of the blade. I can easily keep an eye on the pattern while cutting, and cutting in that direction makes navigating around much easier. For a concave curve like an armhole or neckline, the opposite is true. I keep the pattern piece to my right. 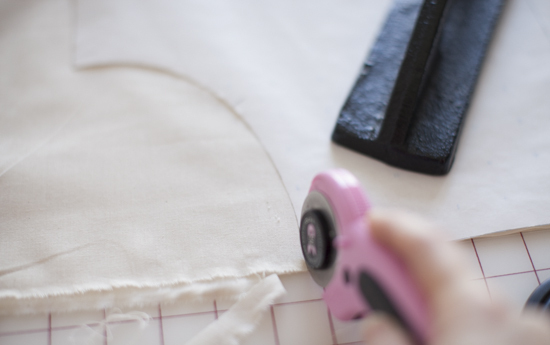 Once everything is laid out and you've started cutting, try to avoid moving any pieces around. This can be very challenging especially if you're working on a small cutting mat, or a table that can't accomodate the entire piece. Just be very careful to realign everything if you do have to move things around. I always seem to forget to snip notches, but I remembered this time - phew! OK! All of the pieces are cut, notched and ready to go. In the few sewing classes I've taken, serging has only been used for finishing. Seams are sewn, and edges serged as you go along. But serging is never part of the actual construction. A "safety stitch" is usually needed. But after doing a little online reading, I think the safety stitch is really only for wovens. A safety stitch isn't appropriate for knits since it would inhibit any stretching. So, I'm moving onward using only the serger for construction... even on the muslin. A 3-thread or 4-thread overlock stitch would work for this. The only difference is that there's an additional line of stitching in the 4-thread stitch which aids in keeping the stitching from unraveling. This automatic threading system is amazing. As a beginner, the last thing I want to worry about is the threading of the loopers. Vertical stitching: The two front pieces serged together. Horizontal stitching: The fronts serged to the back piece lining up the stitching with the center back. - Careful with the pins. You'll ruin your blade if you knick them. - Because you can't start by feeding the fabric in before the blade and foot, angle the fabric to serge onto it, or cut out a little divet so it can be placed right in front of the blade to start serging. - DIFFERENTIAL FEED. The differential feed can help the easing of the materials together. It also helps a lot with knit fabrics in that it controls it and keeps it from splaying out and kind of ruffling. I've only ever played with these settings, so this will be a learning experience. OK, I cut a little divet and I kept my differential feed at N starting at the underarm/side seam. Once I reached my first notch, I moved my differential feed up to 1.5. Since the easing happens between the notches, you wouldn't want to be easing at the underarm. Differential Feed - The lever looks misaligned when viewed straight on, but when viewed from your working position it's lined up correctly. Once I reached my other notch, I moved my differential feed back to N, then serged off the side, at an angle. Upon inspection, the 1.5 setting seemed to work fine. The notches lined up nicely between the sleeve cap and the armhole. I can't wait to get going on the real fabric. Stay tuned!